The majority of reviewers praised the Adidas Ace 16+ Ultraboost for its sleek and laceless design. This boot is one of the few laceless boots that offers an incredibly comfortable fit, as mentioned by a good number of users. Being compared to Adidas X 18+ Trainers, this shoe also looks great for casual wear, especially when worn with jeans or shorts said many wearers. Some players who tested the football boot found it to be of excellent quality. Based on the opinion of several testers, the Ace 16+ Ultraboost provided excellent arch support. A few purchasers commended that this boot belongs to a list from Adidas that shows exceptional flexibility when used on the pitch. A certain user mentioned that the all white colorway of this boot looks really clean. A few testers found the Adidas Ace 16+ Ultraboost to be an expensive football boot. Based on the experience of some wearers, the boot fits a bit tight for their preference. A few individuals who tried the boot observed that it is quite hard to put on because of the tight opening. Although not all, but this had been a common complaint amongst laceless boots like the Nike MercurialX Proximo II Turf. One user observed that this Adidas boot is a bit heavy when worn. With a sleek laceless design, the Adidas Ace 16+ Ultraboost is a boot that can effortlessly go from the courts to the street. It features the brand's most responsive cushioning system, the Ultraboost technology. It gives an edge when it comes to comfort. The Primeknit upper, on the other hand, provides a snug and secure fit that makes sure the foot won't slip during the game. Combining the best features from the brand's running and football lines, the Ace 16+ is more than just an eye-candy. In terms of comfort, it’s amazing. In terms of the design, it’s pretty good. Overall, it is a nice-looking shoe. I like the minimal aesthetic and construction, however this colorway is not for me. Unless you want to wear this specific colorway, I would rather spend my money on other Boost models which look and feel a lot better. 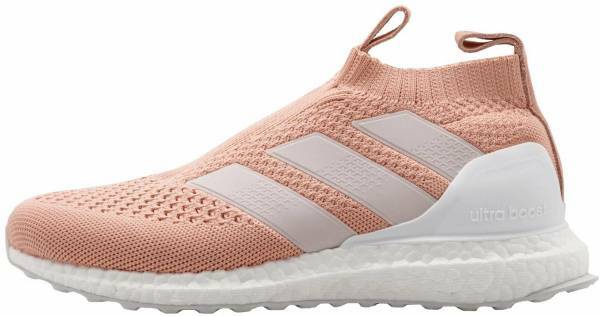 Adidas has fitted the Ace 16+ Utraboost with a flexible Primeknit upper that provides a form-fitting wrap around the foot. The design improves stability during the game, preventing the foot from slipping. The upper material also allows for adequate breathability alongside a close ball touch. Another highlight of the boot is its Ultraboost midsole. Initially, a feature found in Adidas running shoes, this leading technology functions to provide responsive cushioning for optimum in-shoe comfort. Moreover, this spongy thermoplastic polyurethane (TPU) sole holds temperature-resistant properties that allow for a more consistent run. Between the heel and the forefoot, the boot has incorporated the Torsion system for added stability. This feature gives necessary support for the heel and allows the feet to adapt to different surfaces while minimizing strain. The result is a smooth heel-to-toe transition during strides and movements. The boot also features the Stretchweb technology on its outsole. This type of outsole works to lower the amount of pressure when the foot hits the ground, increasing comfort. Because of its full one-piece construction, wearers can expect a snug, sock-like experience from the Adidas Ace 16+ Ultraboost. The laceless design along with the soft Primeknit upper facilitates a slip-on convenience as well as breathable comfort. With the enhanced cushioning from the Ultraboost midsole, overall support is also hugely improved. Regarding sizing, the boot comes in the standard men's sizes and fits true to size. Adidas has engineered the boot with a ContinentalTM rubber outsole. This sole unit delivers remarkable traction both in wet and dry conditions. On the external part of the outsole is the Stretchweb. It is utilized to decrease foot strain and minimize injuries during running. The football boot features the Adidas Ultraboost technology. It is designed to provide a more responsive cushioning system. This spongy base lessens stress on the foot for a smooth and steady ride. The upper of the Ace 16+ Ultraboost wears soft, lightweight Primeknit material that gives a sock-like wrap around the foot. This flexible material also offers an adaptive fit that allows for natural, unrestrained movement. Moreover, it facilitates a close touch for improved ball control. The boot adapts a laceless design, offering a comfortable slip-on entry for the foot. Around the midfoot is the knit construction. It provides enough tightness and elasticity to keep the foot in place during the game. The street-ready soccer shoe can be personalized with a minimal fee.